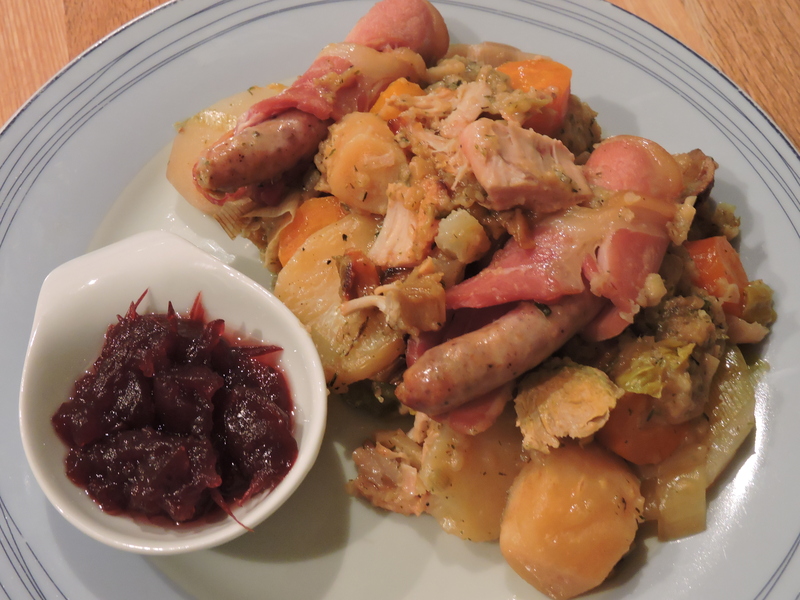 A Full Christmas Dinner in a Domu Slow Cooker! Recently, the lovely team at Domu.co.uk sent me a VonShef Slow Cooker to experiment with at home. 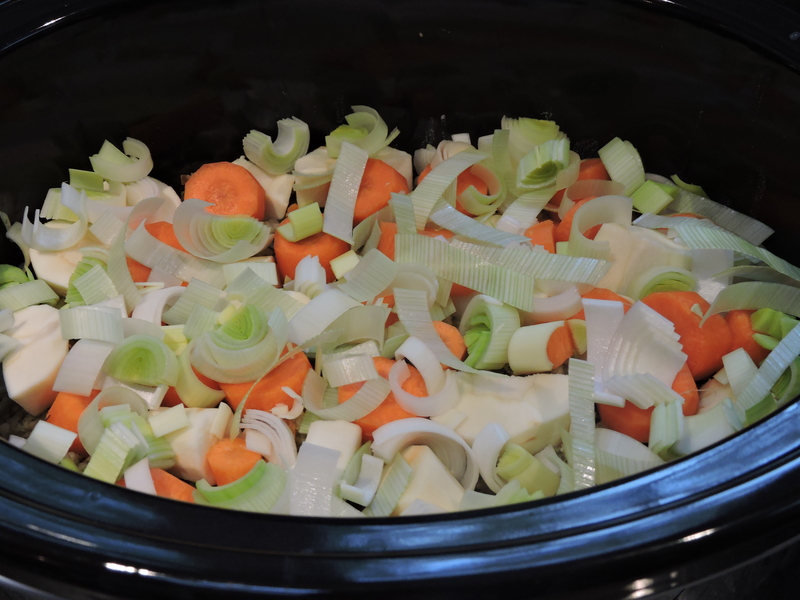 I’d always wanted to try out a slow cooker but I’d never got round to buying one – I was always a bit nervous about leaving an appliance on for so long, especially if it involved leaving the house. But so many friends recommended getting one, I figured I was just being over paranoid. Heat up the slow cooker and mix the flour and chicken stock in it. Add the turkey and coat in the flour/chicken stock mix, with a sprinkle of salt and pepper. Now add the halved brussels sprouts on top of the turkey. Next prepare the stuffing in a bowl (just need to add boiling water) – if I was preparing a full Christmas Dinner for family, I would make my own stuffing from scratch, but for experimentation purposes in this case, I used a packet mix! 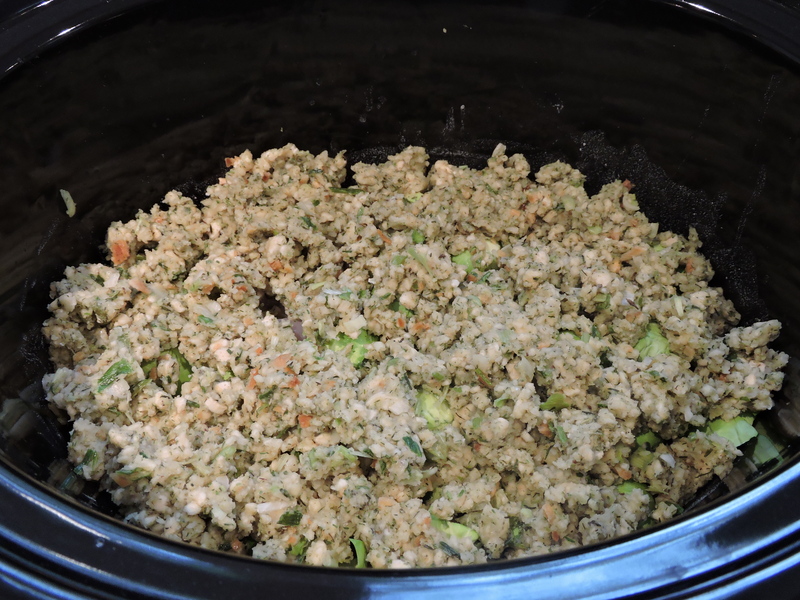 Then add the stuffing as the next layer in the slow cooker. The next layer is made up of the carrots, parsnips and leeks. 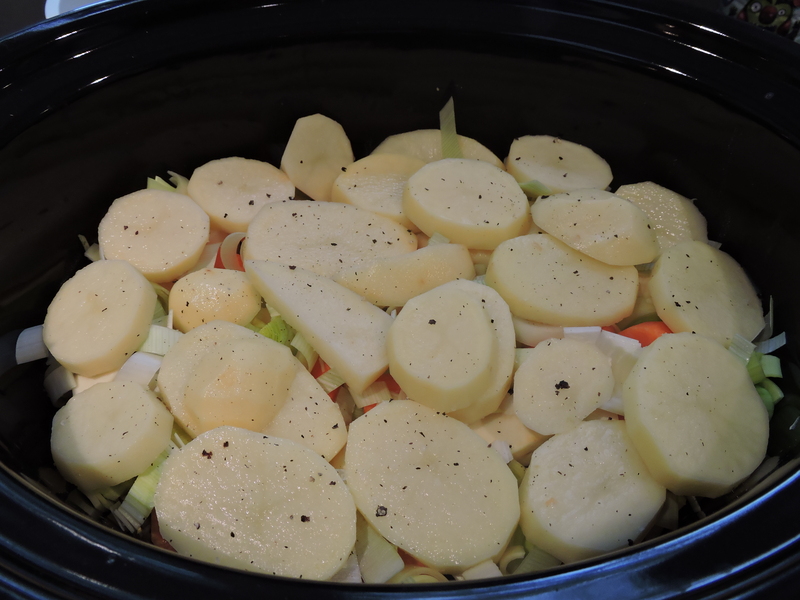 Place the potatoes on top, to make the final full layer, with a dash of salt and pepper. And finally, what British Christmas Dinner would be complete without Pigs in Blankets? 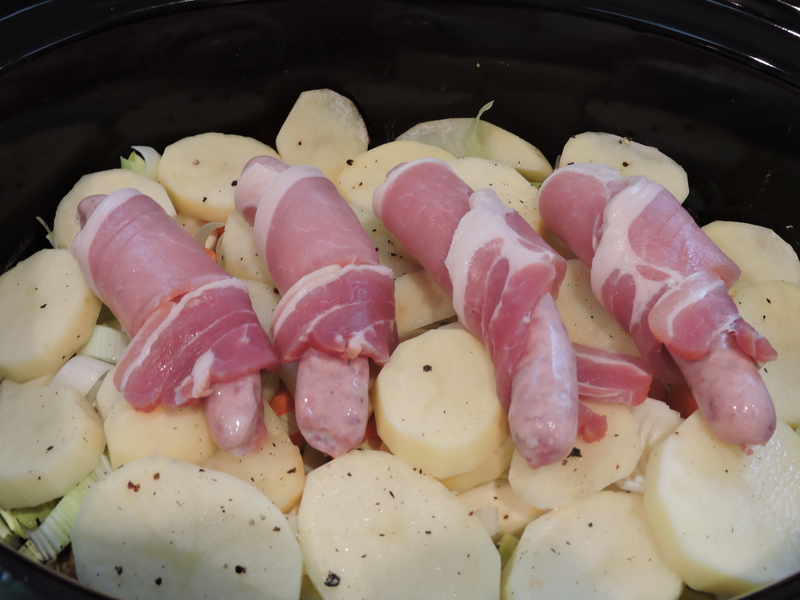 Wrap the chipolatas in the bacon and place them on top of the potato layer. Pop on the lid and leave to cook for around 5 hours. Now a meal like this is never going to look pretty – it’s a dish consisting of layers of food that really shouldn’t be layered. But my word, it tasted GOOD! I was actually surprised at just how good it tasted. I don’t think my family would be too impressed if I dished this up on Christmas Day, but I’m pretty sure they’d be shocked once they had a taste of it. It’s got all your typical Christmas Dinner flavours in there, it’s just not how you’d typically expect to see it. Tim and I definitely went back for seconds! 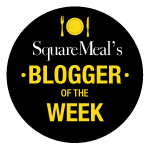 Next week I’ll be giving away one of these fantastic slow cookers, so keep your eyes peeled! 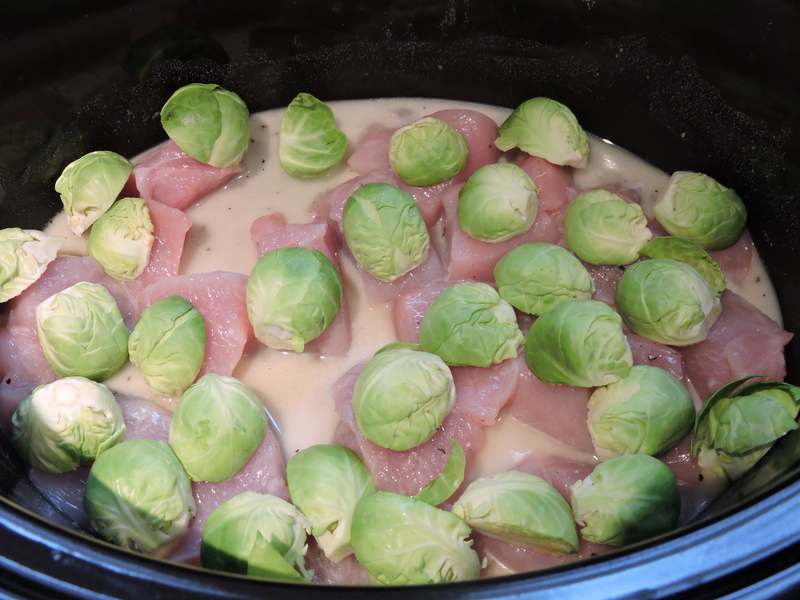 But if you’d like to take a look at them in the meantime, you can find out more on the Domu website here, including their slow cooker recipe hub. 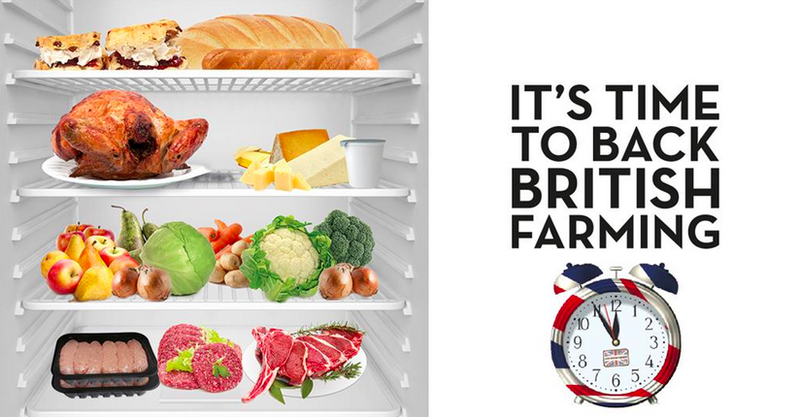 Be warned – you will be tempted to buy everything on this website, I love it!! There’s lots of great gift ideas for Chrimbo, too! I was sent a slow cooker for review purposes by Domu.co.uk, but did not receive any payment. All views are my own.